Little Bear is ready for adventure! Mommy Bear has some helpful advice – if only Little Bear would stop and listen! “Wait a minute. 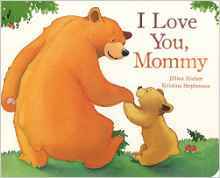 There is something you might want to know.” In this heartwarming picture board book, Mommy Bear does her best at teaching her little cub a few lessons before he gets himself into real trouble. Little Bear is rambunctious, curious, and wants to try everything himself. Sounds familiar doesn’t it, to all my readers who have toddlers? It certainly hits home for me! I found this to be a wonderful book to read to our toddler, Brie, because it speaks so endearingly about the importance of listening to your mother. The book has beautiful illustrations and easy-to-read text that my kindergartner can read. Practice your reading out loud skills and get your whole family involved when reading! Please note: This book is best suited for ages 3-8 per Parragon Books. Have a wonderful and happy Mother’s Day weekend to all the moms reading this post! About Parragon Books: Publishing for over 25 years, Parragon has aimed to exceed expectations, providing readers & retailers with high-quality, engaging content at incredible value. Check out the Parragon Little Learners website page for more information about additional books and apps for young children. About the Author: Kristina Stephenson is a popular children’s book illustrator, whose works include Lion’s Baby Bible and The Time-For-Bed Angel.